Me: Hmmm. 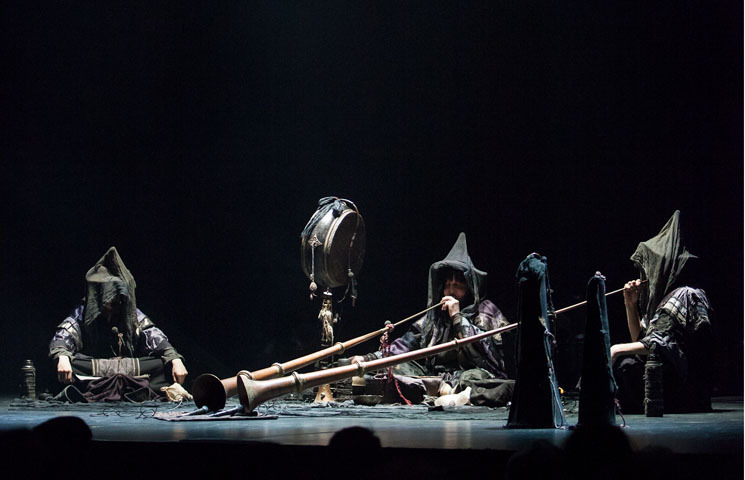 According to the program a Russian guy named Alexey Tegin formed Phurpa after an early stint in industrial music, and he adopts much of their music and ritual from a pre-Buddhist Tibetan tradition called bön. Phurpa: Very low throat drone. Very low throat drone. Very low throat drone. Very low throat drone. Very low throat drone. Very low throat drone. Very low throat drone. Very low throat drone. Me: This is going on for quite a while. Me: They aren't especially good at playing those. Phurpa: (resuming low throat drone) Very low throat drone. Very low throat drone. Very low throat drone. Very low throat drone. Very low throat drone. Very low throat drone. Very low throat drone. Very low throat drone. Very low throat drone. Me: Am I supposed to be going into a trance or something? Phurpa: Very low throat drone. Very low throat drone. Very low throat drone. Very low throat drone. Very low throat drone. Very low throat drone. Me: Is this cultural appropriation? It feels a little like it. Me: Well… Let's go see if it's still nice outside.